A new breeding season is almost over, and Dinang Creek has had a very productive year! As many as 38 hatchlings were born at this site only, which is almost as many as all of San Mariano in any other year. On March 10, Marites Balbas, community organizer at Mabuwaya, visited the Kringloopwinkel in Ermelo, The Netherlands. She was personally able to thank the volunteers at this organization for sponsoring the CROCS program. From November 22 to 26, four students of Veterinary Medicine of the Isabela State University, Echague campus, did their internship at the Municipal Philippine Crocodile Rearing Station in barangay Minanga, San Mariano. 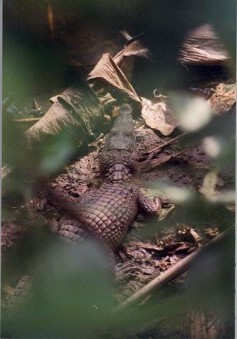 On September 24, 2011, another 10 head-started juvenile Philippine crocodiles were released back into the wild. Together with Sangguniang Bayan member Hon. Didero B. Pascual and MENRO staff Donna Labuguen, the team travelled to sitio Dunoy. Thirtythree students of DevCom went to find and observe the Philippine crocodile in the wild, in Dunoy, a small remote village on the edge of the Northern Sierra Madre Natural Park and one of the last remaining breeding sites of this critically endangered species. This weekend a new batch of crocodiles hatched next to Dinang Creek. This is the second nest this year, but the first one from barangay Cadsalan. 24 May 2011 Mabuwaya website online!